In the end the flight from Mumbai to Goa was over two hours late. Sun was setting when we finally got on board. I was admiring the beautiful sunset and taking pictures of it with my phone camera, when the airhostess started to complain and told me to delete all the pictures I had taken. I thought it was only in Goa airport, where you weren’t allowed to take photographs. Finally yesterday I got to wet my toes in the Arabian Sea. 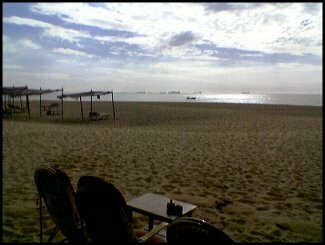 I enjoyed my tea in a beachshack, where I spent my time reading a good book until it was time for the sunset. Which was, beautiful. The only negative thing here, and I mean the only, is the hard mattress in my bed. Otherwise I’m happy. The weather is hot during daytime, but after a few days it will get cooler, say the locals. Nights are already rather cool – I’m almost freezing, when wearing a t-shirt only. Quite a many tourists have arrived here. I was eating in a Chinese restaurant and the next table was having a conversation in Finnish. Next "Stepping on a cowshit brings a good luck"